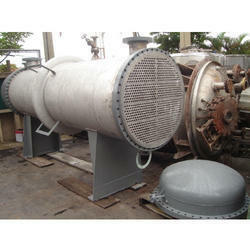 We are offering Heat Exchanger to our clients. A shell and tube heat exchanger is a class of heat exchanger design. Heat exchangers are devices used to transfer heat energy from one fluid to another. The fluids are separated by a solid wall to prevent mixing. The Shell and tube heat exchanger is made up of bundle of parallel heat exchanger tubes held in place with tube sheets and placed into a shell. They can provide large amount of effective tube surface while minimizing the requirements of floor space, liquid volume and weight.Shell and tube exchangers are available in a wide range of sizes. Shell and tube heat exchangers are the most common design for many applications. Various capacities of Shell and tube heat exchanger are supplied.